You already know about serotonin’s effect on mood. But what does serotonin do beyond that? You may be surprised by its other potential effects. What does serotonin do? Known most for its effect on our mood, it can come into play with depression and also is being studied for a potential link to Alzheimer's disease. It’s an important question in trying to understand the chemicals that help define us: “What does serotonin do?” Serotonin is a neurotransmitter—a brain chemical that helps to activate communication between brain cells. Neurotransmitters work by binding to receptors (molecules of protein that receive external signals) on the surface of cells. Serotonin is believed to have at least 14 of these receptors, so as you can imagine, the role of serotonin in the body is varied. Serotonin also maintains your level of alertness when you’re awake, and it helps regulate your appetite. As far as the latter is concerned, something you may not know about serotonin is that most of it actually resides in your gastrointestinal tract. However, it can’t pass into your brain from your gastrointestinal tract because of the blood-brain barrier. This layer of tightly knit fatty cells covers the blood capillaries of the brain, altering their permeability and preventing certain chemicals in the bloodstream from affecting brain tissue. It’s one reason why brain tumors are so hard to treat. What Does Serotonin Do for Cognition? Recent research has revealed other interesting information for serotonin’s role in the body. A 2017 study, for instance, found a possible link between memory and thought lapses and low levels of serotonin. It isn’t the first study to suggest such a link; previous research has also shown that people suffering from Alzheimer’s disease have low serotonin levels. But the earlier studies haven’t been able to clarify which came first: Could low serotonin levels be a cause of Alzheimer’s, or could Alzheimer’s cause serotonin levels to decrease? Researchers who worked on this particular study, published in the journal Neurobiology of Disease (September 2017), specifically looked at the levels of serotonin reuptake transporters in the brains of older adults who were suffering from early symptoms of cognitive decline. It’s these transporters that deliver serotonin to its receptor on the surface of another cell. Brain scans revealed that the study participants had up to 38 percent less serotonin reuptake transporters in their brains compared with cognitively healthy seniors. In memory tests, having fewer serotonin transporters correlated with lower scores. 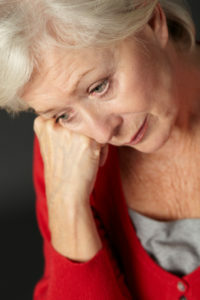 The leader of the study, Gwenn Smith, PhD, professor of psychiatry and behavioral sciences and director of geriatric psychiatry and neuropsychiatry at Johns Hopkins University School of Medicine, suggests that these data point to low serotonin levels occurring first, rather than being a byproduct of Alzheimer’s disease. Professor Smith also suggests that preventing low serotonin levels might be a therapeutic approach for Alzheimer’s disease. Doctors have tried to treat Alzheimer’s disease with SSRIs, but the results haven’t been very promising. However, Professor Smith notes that SSRIs work by binding to serotonin reuptake transporters—and if these are at lower levels in cognitively impaired people, the drugs may not work effectively. “Now that we have more evidence that serotonin is a chemical that appears affected early in cognitive decline, we suspect that increasing serotonin function in the brain could prevent memory loss from getting worse, and [could] slow disease progression,” Professor Smith says. What Does Serotonin Do That’s Bad for You? It isn’t all good news when it comes to serotonin’s role in the body. For example, a study published in the journal Cell Reports (Aug. 22, 2017) suggests that serotonin may have something to do with tinnitus, a condition in which you perceive noises in one or both of your ears even though there aren’t any external sounds. The noises can occur persistently, disturbing your sleep and affecting your ability to concentrate. Plus, tinnitus has been linked with depression, anxiety, and stress. In the study, scientists discovered that cells in a certain region of the brain associated with tinnitus became hyperactive and hypersensitive to stimuli when exposed to serotonin. The study was carried out in mice, so it doesn’t necessarily translate to humans. However, it’s possible that the results may point to the reason why people with tinnitus who take SSRIs to help treat depression or anxiety often report that their tinnitus gets worse while they are taking the drugs. What Does Serotonin Do If Your Levels Are High? Too much serotonin can also cause “serotonin syndrome.” According to the National Institutes of Health, normal serum serotonin levels range from about 101 to about 283 nanograms per millimeter. If you go far above this, you could suffer from such symptoms as fever, sweating, body tremors, sweating, agitation, and diarrhea. Most cases of serotonin syndrome are mild, but severe serotonin syndrome can result in seizures and even death. It’s important not to combine these drugs. And keep in mind that you shouldn’t combine them with natural remedies that can increase serotonin levels, among them L-tryptophan and St. John’s wort. If you develop symptoms that might indicate serotonin syndrome, contact your doctor. It’s possible he or she might tell you to stop taking your medication, but don’t do so without medical guidance. alzheimer, antidepressants, anxiety, anxiety and insomnia, anxiety and stress, appetite, blood brain barrier, boost serotonin, brain, celexa, citalopram, cognitive decline, depression, depression anxiety, depression or anxiety, depression symptoms, diarrhea, ears, feelings of anxiety, fluoxetine, for depression, gastrointestinal, health, hearing, hearing loss, increase serotonin, increase serotonin levels, increasing serotonin, insomnia 2, low levels of serotonin, low serotonin, low serotonin levels, memory, memory loss, memory tests, mental health, mood, natural remedies, neurotransmitter, paxil, prevent memory loss, protein, report, selective serotonin reuptake inhibitors, serotonin, Serotonin Deficiency, serotonin function, serotonin levels, serotonin reuptake, serotonin reuptake inhibitors, serotonin supplements, sleep, stress, supplements, tinnitus, to treat depression, too much serotonin, treat depression, tricyclic antidepressants, tryptophan, what does serotonin do. Can my doctor detect if my Serotonin levels are low ie blood tests??? I thought you might be interested in this article on https://universityhealthnews.com: What Does Serotonin Do?